average around 220 kg (480 lb.) for males and 130 kg (290 lb.) for females. 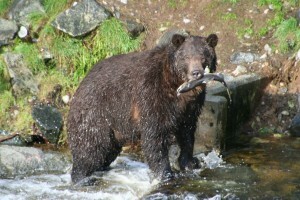 Average fall weights are about 30 to 40 percent more.” This bear would be larger than the average. After your snack and normally before dinner it is time for a tour of the local area. The tour is an hour to an hour and a half depending on the wildlife we encounter. We look for bald eagles, harbour seals and black bear. 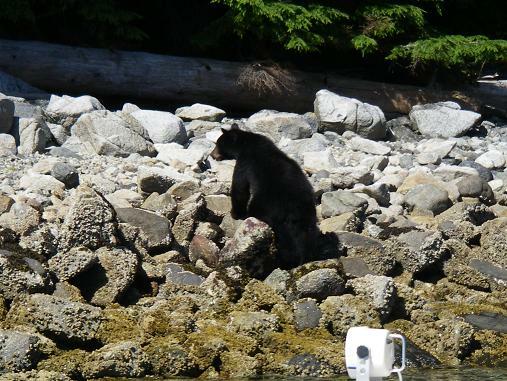 The bears come to the beach to turnover rocks. This inter-tidal zone “food” is high in protein and is made up of crab, clams, barnacles, amphipods and other tiny invertebrates. The tour also familiarizes you with the boat and guide although your guide may change depending on the day’s activities.